The Dollar Box: The Power and the Prize! Welcome back to The Dollar Box, where I look at single-issue stories or short runs of comics with an original cover price of one dollar or less. After reviewing a Nick Fury story and a Spider-Man book that cost all of twelve cents each, this time we soar into the stratosphere with a book that cost an astronomical twenty-five cents when it was published in 1968 — Silver Surfer #3! Over at Longbox Graveyard, I looked in detail at The Silver Surfer, and concluded that the series went off the rails after the first four issues… but those first four issues are very good, and I think issue #3 is the best in the run. Many fans point to issue #4, featuring a battle with Thor as the high point of the series, but I prefer this cosmic tale in issue #3 — “The Power and the Prize!” — as it showcases the Surfer at his melodramatic Silver Age best. Written by Stan Lee, with pencils by John Buscema — at the top of his superhero game here — and adequately inked by Joe Sinnott, this tale opens with the Surfer exiled to earth by his former master Galactus. Finally having enough of man’s prejudice and violence, the Surfer steals a page from The Day The Earth Stood Still and lashes out with his Power Cosmic to bring our world to a halt. This gets everyone’s attention, of course, but also attracts the gaze of Mephisto, making his first Marvel Universe appearance. Mephisto is Satan in all but name, and upon seeing the Surfer he is reminded of the martyrs that humiliated him in the past, and immediately determines he must bring the Surfer to his knees. Mephisto decides to strike at our hero through Shalla-Bal, the Surfer’s lost love. 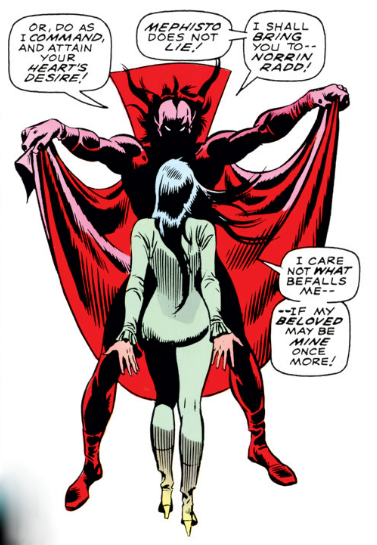 In Devil-like fashion Mephisto tricks Shalla-Bal into pledging herself to him that she and the Surfer may be together again, setting off a direct conflict between Mephisto and the Surfer in Hell itself, battling for love and souls. 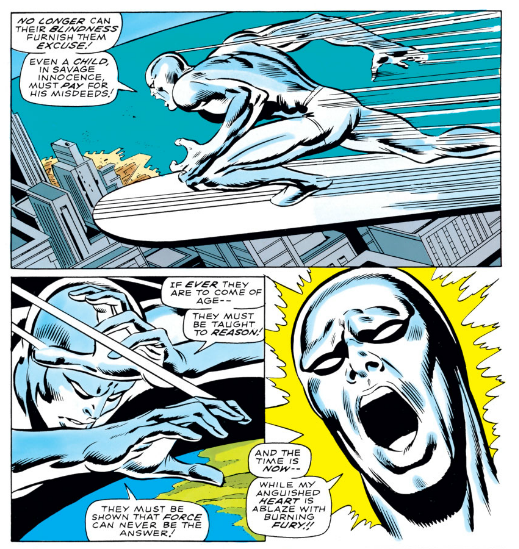 Stan Lee’s script is cartoonish and over-the-top and even a little corny at times, as was most of his Silver Age work, but it fits especially well with the Silver Surfer, who is a kind of doomed, star-crossed Shakespearian character prone to long, emotional soliloquies about his shortcomings and longings. 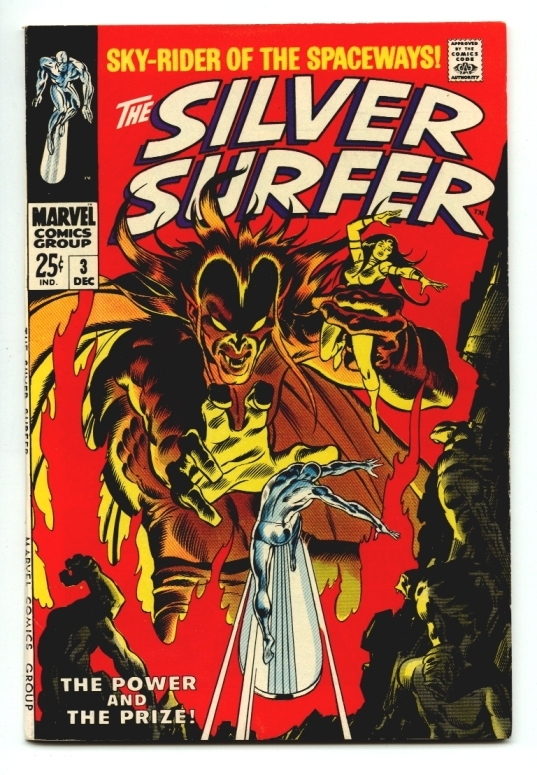 These characters really chew the scenery as they fight through Hell, with Mephisto trying to tempt the Surfer with wealth and women and power, and the Surfer nobly resisting and battling various demons from the pits. 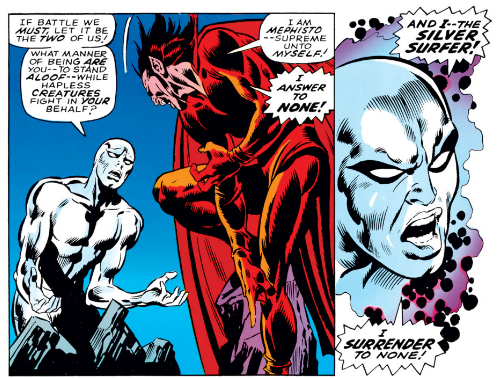 It’s all very exaggerated and overwrought, almost like an opera, and not a little surrealistic — at one point Mephisto shrinks the Surfer down to the size of the palm of his hand, and swallows our hero, only to reject him because he cannot abide the Surfer’s goodness. 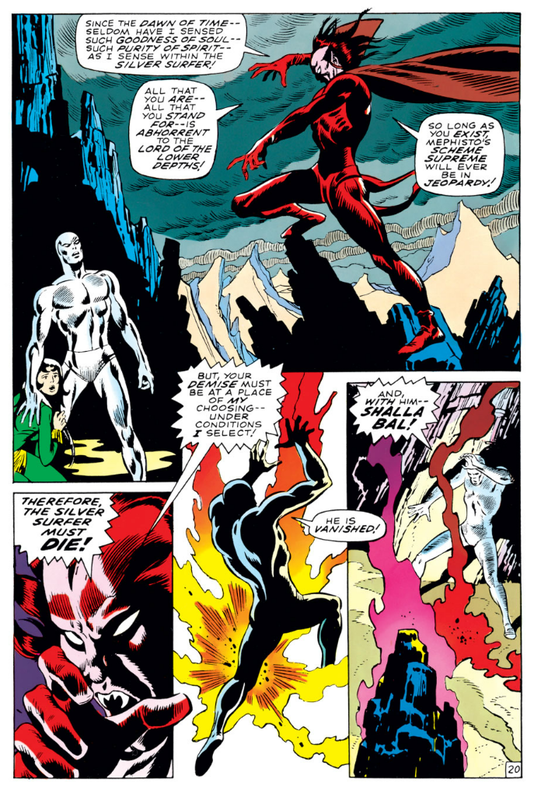 Finally Mephisto demands that the Surfer swear him allegiance, or he will send Shalla-Bal back to Zenn-La, and the Surfer refuses, knowing this will trick Mephisto into sending his beloved back to safety, even though it will break his heart. 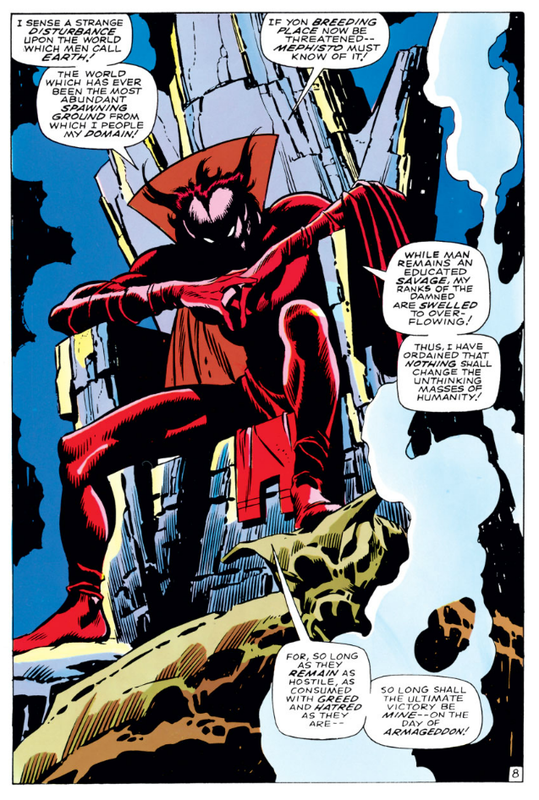 It’s high adventure for the highest of stakes, made more personal for the relationships at the center of the story, and it’s full of powerful visuals from Big John Buscema, who seemed to especially relish drawing the devilish Mephisto, with his grasping talons and Satanic expressions and flowing cape. Stan Lee really cuts loose, too. Arguably the greatest Marvel story of all — Fantastic Four #48-50 –pit heroes against God in the form of Galactus, and here we have a similar level of ambition, as our hero battles Satan himself. An original copy of Silver Surfer #3 in “Fine” condition can easily run a hundred dollars or more, so readers desiring to own this fun tale in print are advised to track down one of the many affordable reprints — but if you find an original for cover price, be sure to send it to me! You’ll find me over at my home blog: Longbox Graveyard, where it’s always 1978! Thanks for reading and I’ll see you again next month with more four-color gold from The Dollar Box! These are our myths. Stan Lee, Ditko, Kirby, Buscema, Romita and ill are the Homers of our day. Or they were hacks who wrote hilariously melodramatic children’s books. To truly appreciate Silver Age stories, you must either mock or revere them. I choose reverence. Silver Age books had so much packed into one issue! I love reading silver age, as it breaks everything down to it’s core. It’s a stripped down jet fighter with nothing but a cockpit and an engine, so you better hold on! They’re classic, overly dramatic, hopelessly romantic, and yes, even a little childish at time, but that’s what makes them able to stand the test of time so people like me can sit back, and enjoy the dawn of superheroes. Thanks for the great article, Paul! Wow, this one sounds like quite the gem! Great feature Paul! I love your description of Silver Age comics as stripped-down jet fighters, Tim. Too bad the Silver Surfer never crossed over with Chuck Yeager. I bet Chuck could have found a way to pilot the Surfer’s board right through Galactus’ barrier!